Published under the name "Shawki Rabbani" for his school journal. Shoghi Effendi would have been around age 16 at the time. Images (see below) have been cropped and sharpened. 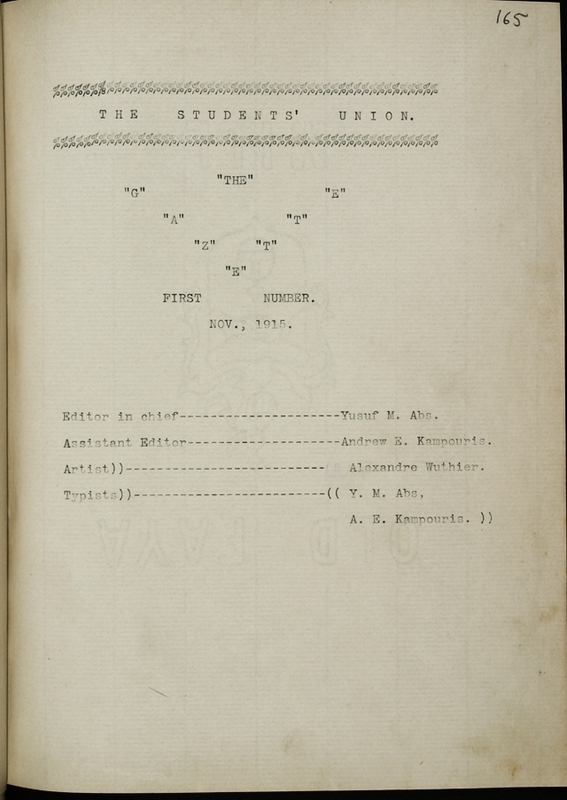 Click on any image to see the original image, as copied from http://ddc.aub.edu.lb/projects/jafet/gazette/1913. See also the original images below. Any deliberative assembly or organization should devise and adopt for itself a constitution and bye-laws which shall be subordinate to the general parliamentary rules of order. But this is not enough, for it is purely theoretical. What is necessary and important is that the members of that organization should master those laws and items in their constitution. They should before anything else acquaint themselves with parliamentary discipline and should practice on them and apply them whenever they find a chance to do so. 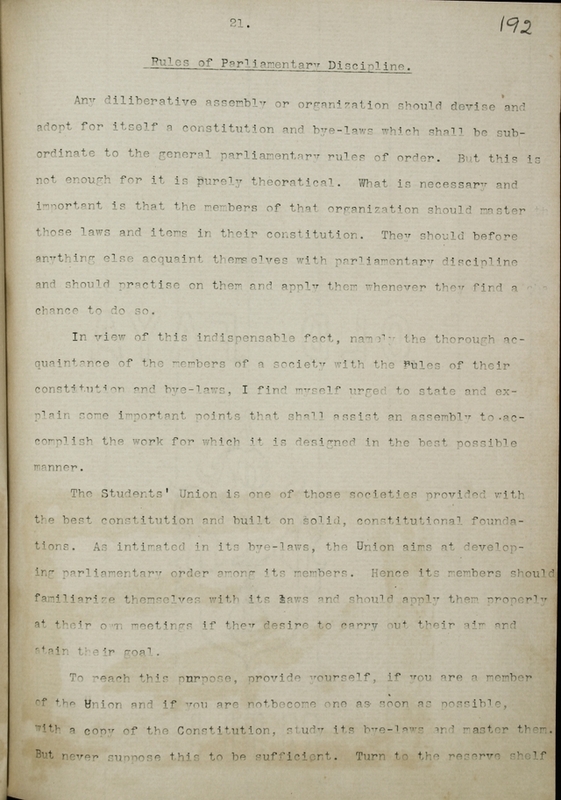 In view of this indispensable fact, namely the thorough acquaintance of the members of a society with the rules of their constitution and bye-laws, I find myself urged to state and explain some important points that shall assist an assembly to accomplish the work for which it is designed in the best possible manner. The Students' Union is one of those societies provided with the best constitution and built on solid, constitutional foundations. As intimated in its bye-laws, the Union aims at developing parliamentary order among its members. Hence its members should familiarize themselves with its laws and should apply them properly at their own meetings if they desire to carry out their aim and attain their goal. 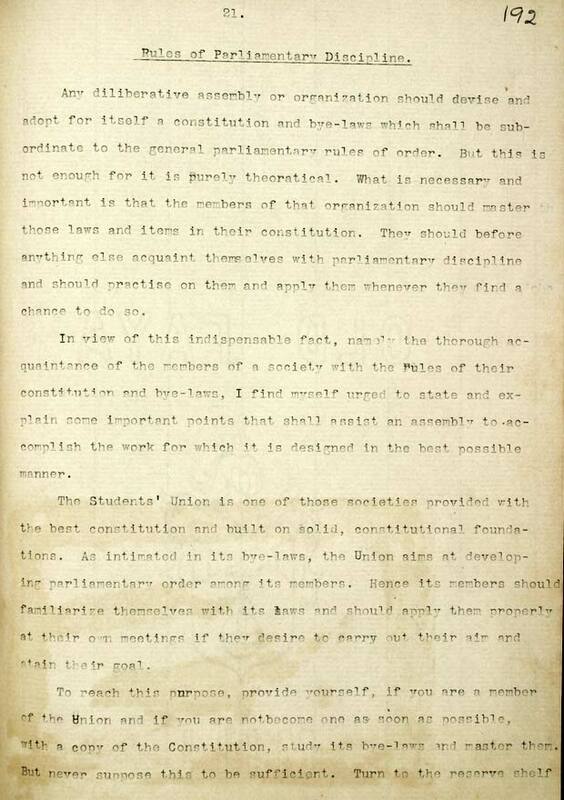 To reach this purpose, provide yourself, if you are a member of the Union, and if you are not, become one as soon as possible, with a copy of the Constitution, study its bye-laws and master them. But never suppose this to be sufficient. 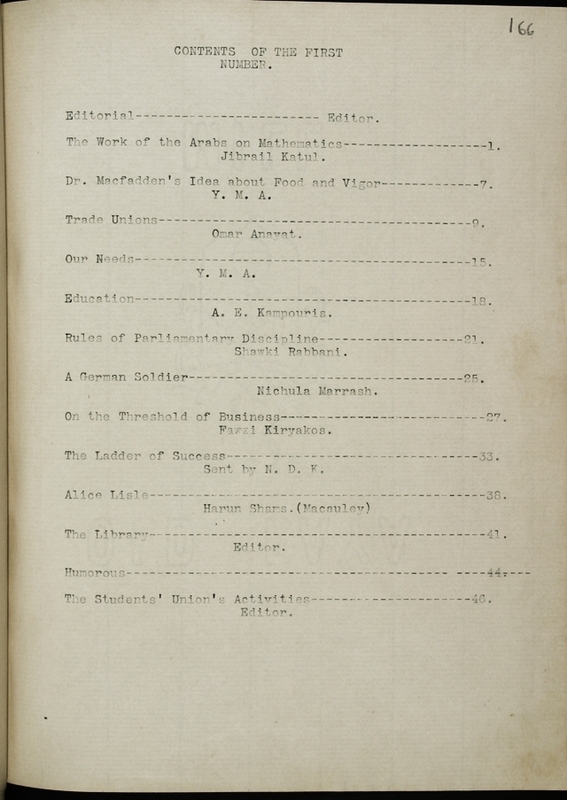 Turn to the reserve shelf in the library and pick out the manual of the "Roberts' Rules of Order" and acquire a general knowledge of its contents. But what a vague statement is this? What a discouraging perspective it has? 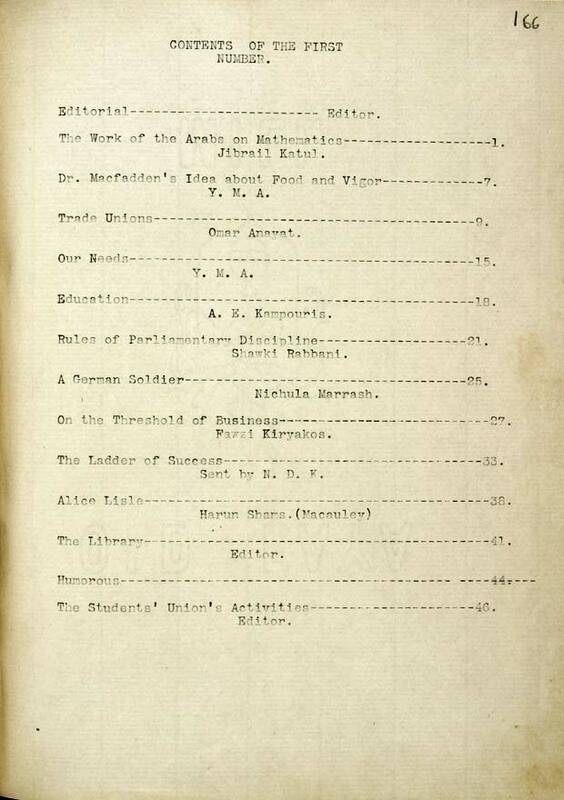 My aim in this present article is to present to you, whom I hope have mastered the Bye-laws of the Union, a short clear satisfactory outline of Parliamentary terms and the order of its procedure. I do not intend by any means to condense the manual of the Rules of Order but I intend to point out the important points leaving out at the same time the details that are either obvious or unnecessary for the present. I should begin to explain some technical parliamentary terms or phrases. What is the difference between a session and a meeting? A session is a meeting which, though it may last for days, is virtually one meeting; it terminates by an adjournment without day. A meeting on the other hand is terminated by a temporary adjournment. As an example let us take an election meeting. We suppose that all the officers of the Cabinet have not been elected on an afternoon, due to the lack of time. 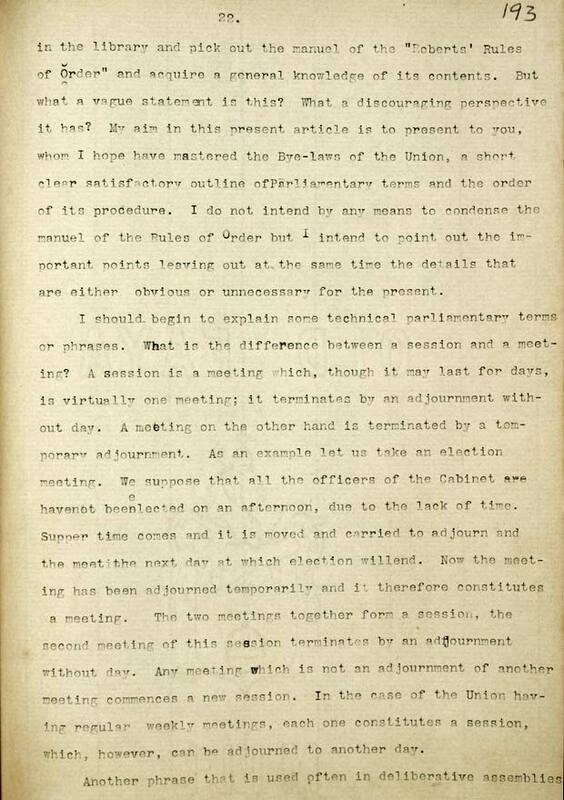 Supper time comes, and it is moved and carried to adjourn and the meet [sic] the next day at which election will end. Now the meeting has been adjourned temporarily, and it therefore constitutes a meeting. 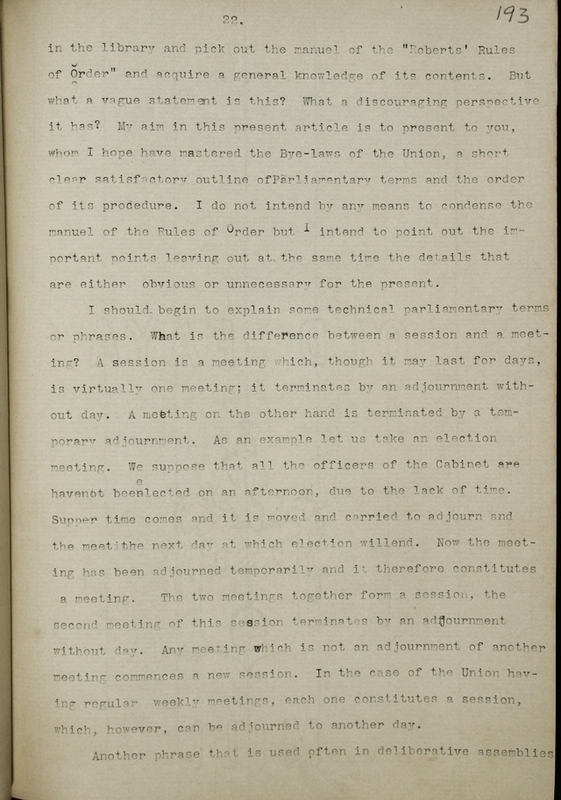 The two meetings together form a session, the second meeting of this session terminates by an adjournment without day. Any meeting which is not an adjournment of another meeting commences a new session. In the case of the Union having regular weekly meetings, each one constitutes a session, which, however, can be adjourned to another day. Another phrase that is used often in deliberative assemblies is the "Call to the previous question". 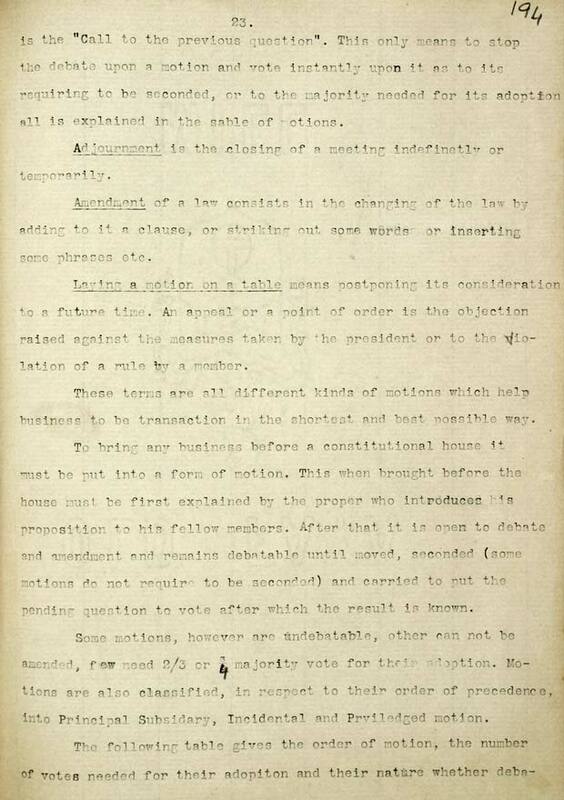 This only means to stop the debate upon a motion and vote instantly upon it as to its requiring to be seconded, or to the majority needed for its adoption all is explained in the table of motions. Adjournment is the closing of a meeting indefinitely or temporarily. Amendment of a law consists in the changing of the law by adding to it a clause, or striking out some words or inserting some phrases etc. 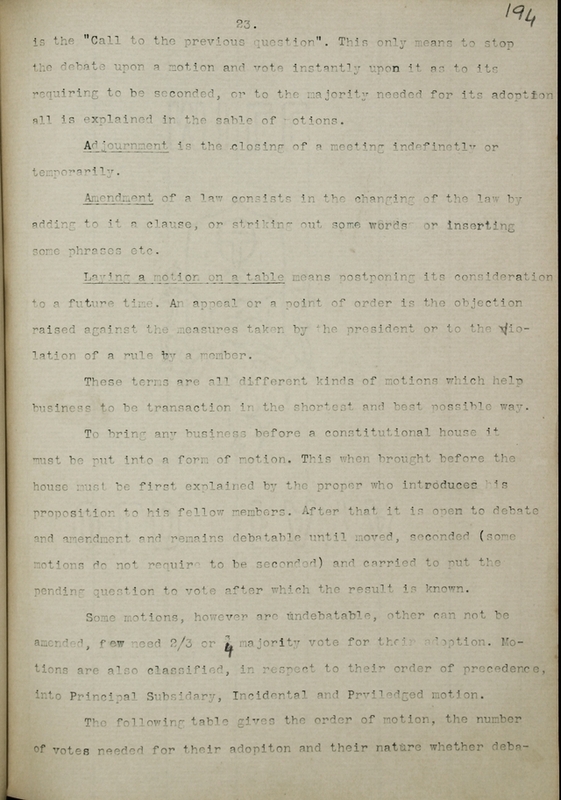 Laying a motion on a table means postponing its consideration to a future time. An appeal or a point of order is the objection raised against the measures taken by the president or to the violation of a rule by a member. These terms are all different kinds of motions which help business to be transaction in the shortest and best possible way. To bring any business before a constitutional house it must be put into a form of motion. This when brought before the house must be first explained by the proper who introduces his proposition to his fellow members. After that it is open to debate and amendment and remains debatable until moved, seconded (some motions do not require to be seconded) and carried to put the pending question to vote after which the result is known. Some motions, however are undebatable, other [sic?] can not be amended, few need 2/3 or 3/4 majority vote for their adoption. Motions are also classified, in respect to their order of precedence, into Principal Subsidiary, Incidental and Privileged motion. 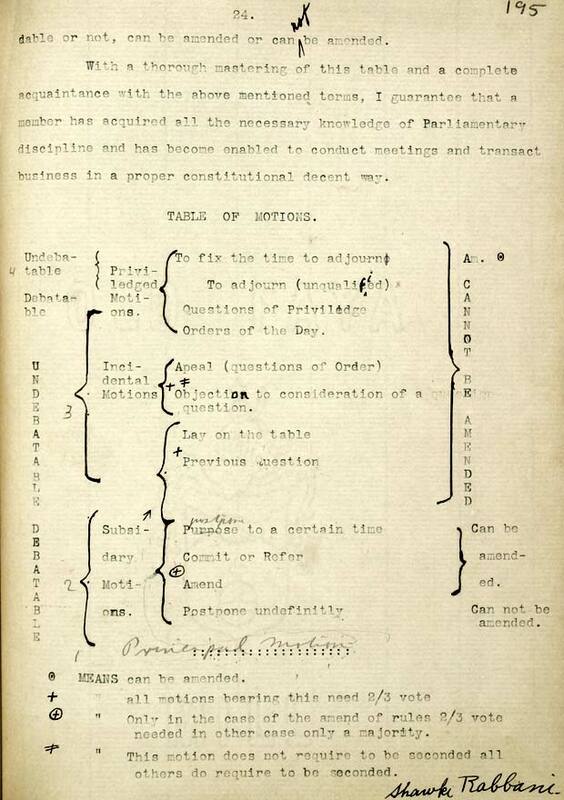 The following table gives the order of motion, the number of votes needed for their adoption and their nature whether debatable or not, can be amended or cannot be amended. 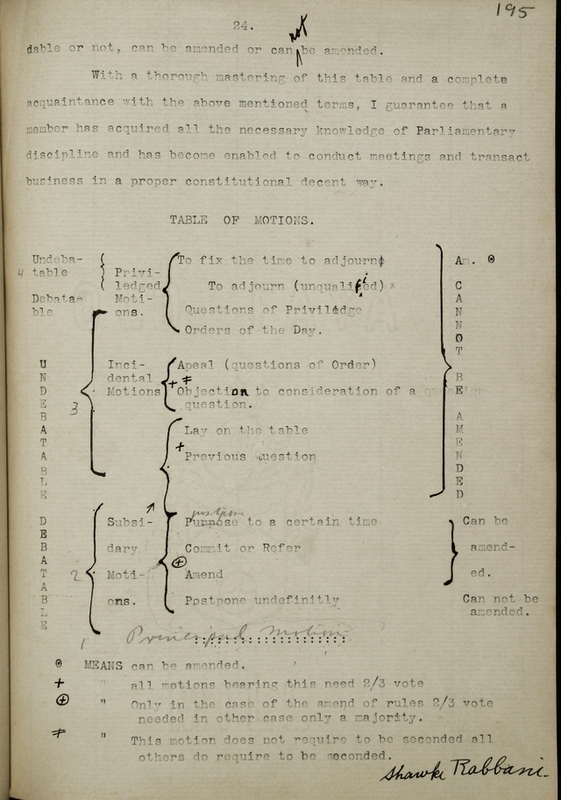 With a thorough mastering of this table and a complete acquaintance with the above mentioned terms, I guarantee that a member has acquired all the necessary knowledge of Parliamentary discipline and has become enabled to conduct meetings and transact business in a proper constitutional decent [sic.] way. +? Objection to consideration of a question. DEBATABLE	2 Subsidiary Motions. Postpone to a certain time	Can be amended. Postpone indefinitely 		Can not be amended. 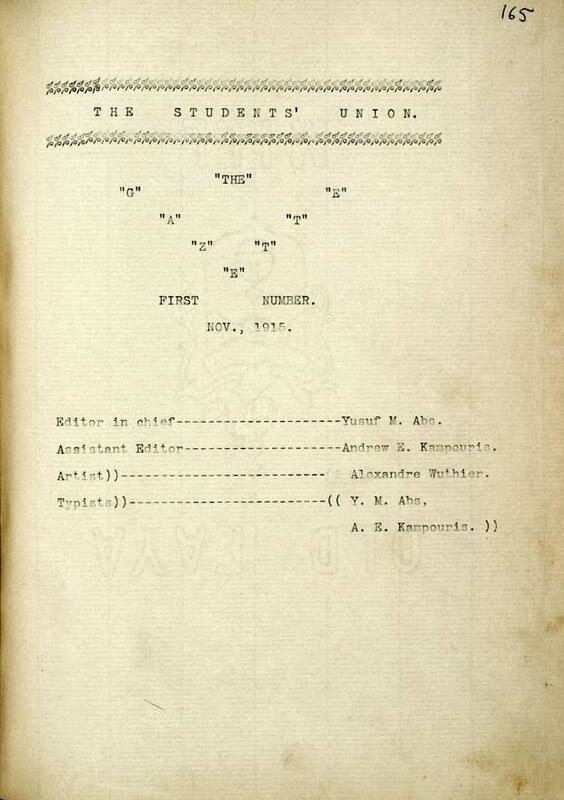 ø " Only in the case of the amend of rules 2/3 vote needed in other case only a majority.
? " This motion does not require to be seconded all others do require to be seconded.